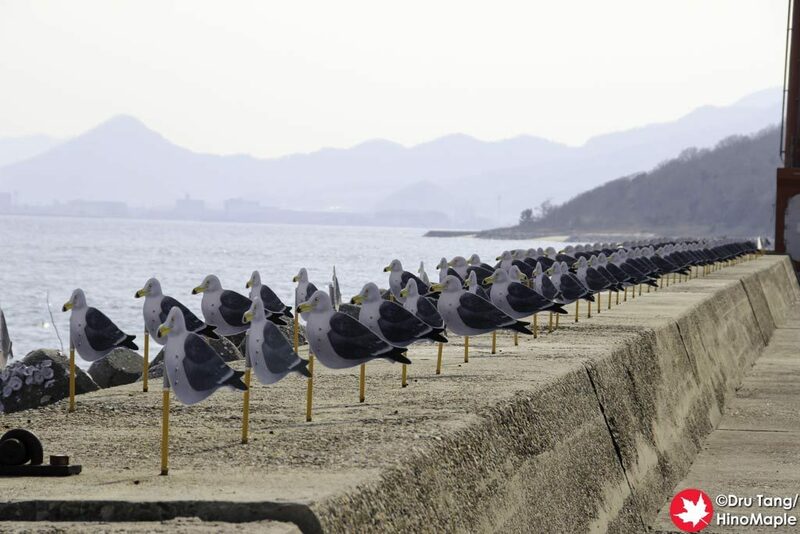 I have always enjoyed “Sea Gulls Parking Lot” by Takahito Kimura when I saw it in 2013. It used to be 2 different artworks, “Sea Gulls Parking Lot” and “Parking Lot for Sea Gulls” but for 2016 they just combined them into a single piece. 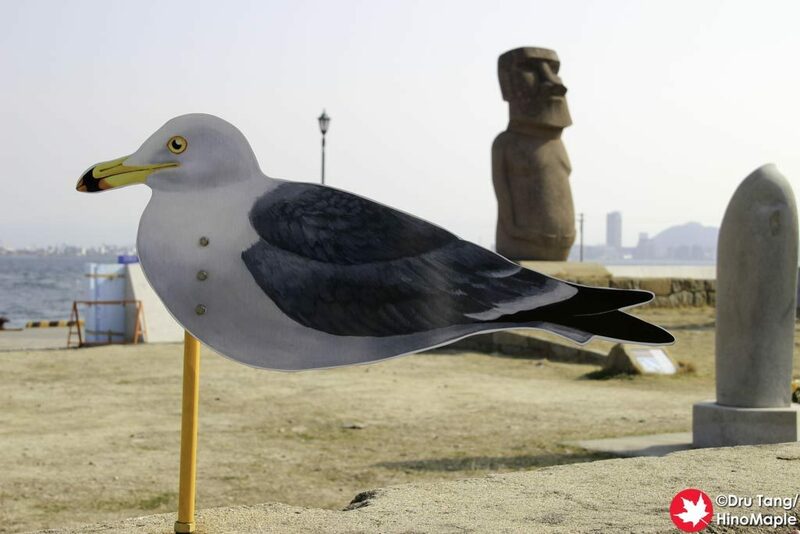 This artwork is something that requires a friend to help as I love taking photos with these seagulls. 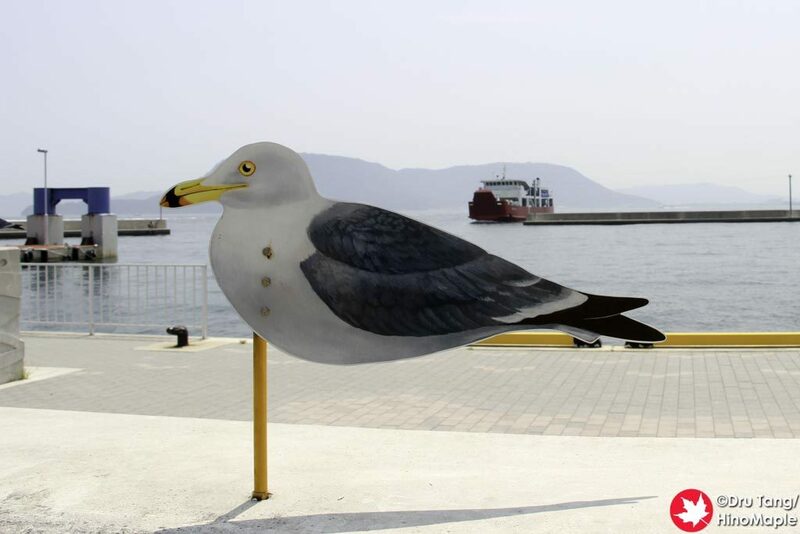 There are hundreds of them all along the wharf of Megijima’s main port and you can’t miss them. As long as you have fun with it, you will enjoy it as much as I did and still do, but you may not enjoy it as it is pretty simple overall. 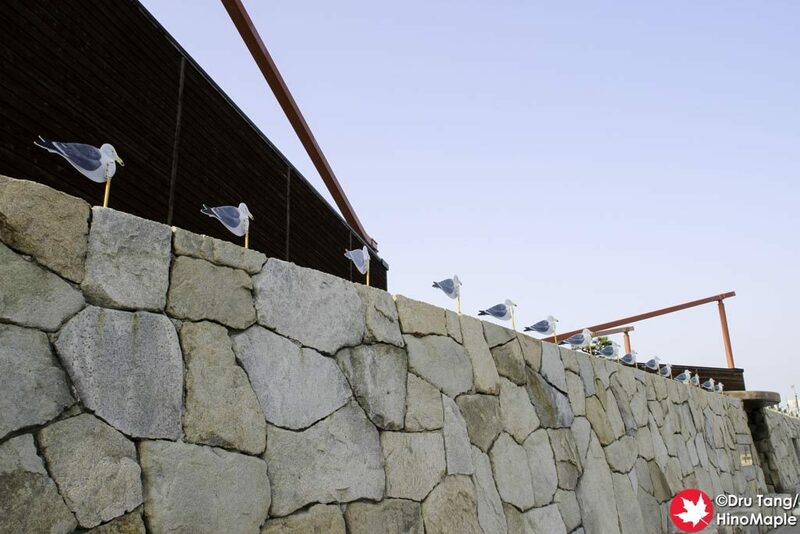 The seagulls themselves are really boring, but they are the permanent welcoming committee of the island. The seagulls all line up along the wharf and they turn in the wind as they are nothing more than wind vanes. 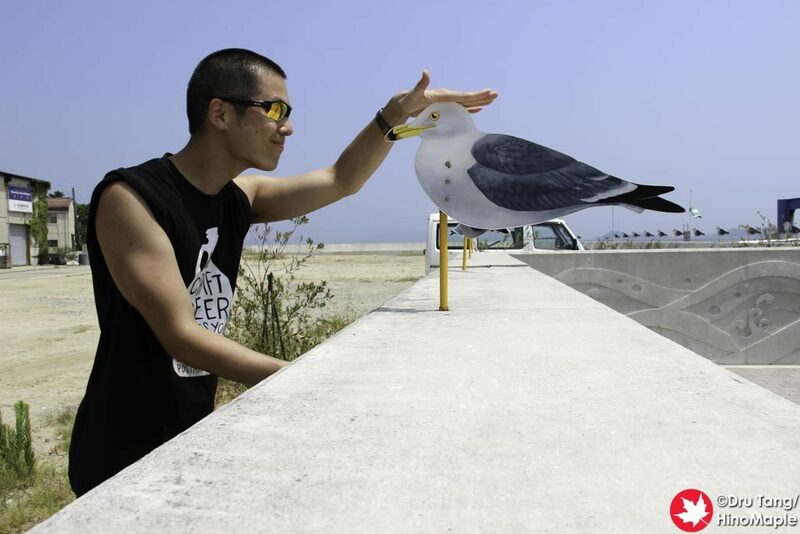 In 2013, my friend was able to take several photos of me with the seagulls and I really loved them. Most people want to take photos of them all lined up as it really does look like a flock of seagulls. It is really difficult to take photos with them when you are alone but it can be done. 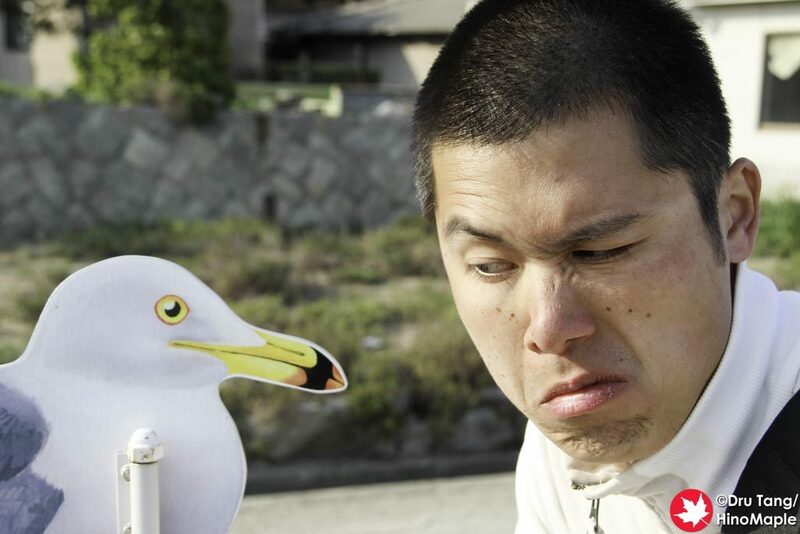 If you are willing to play with the seagulls, I feel they are willing to play with you too. 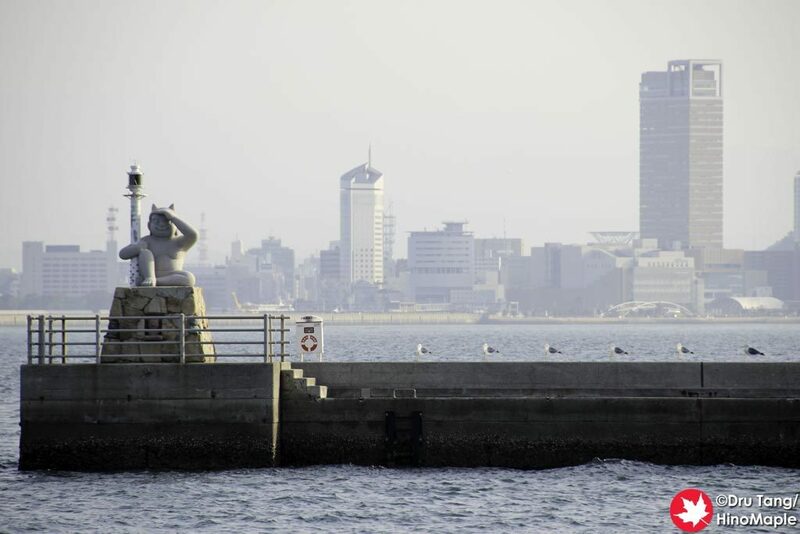 Don’t forget to look down at the sea wall when you are near “20th Century Recall”. 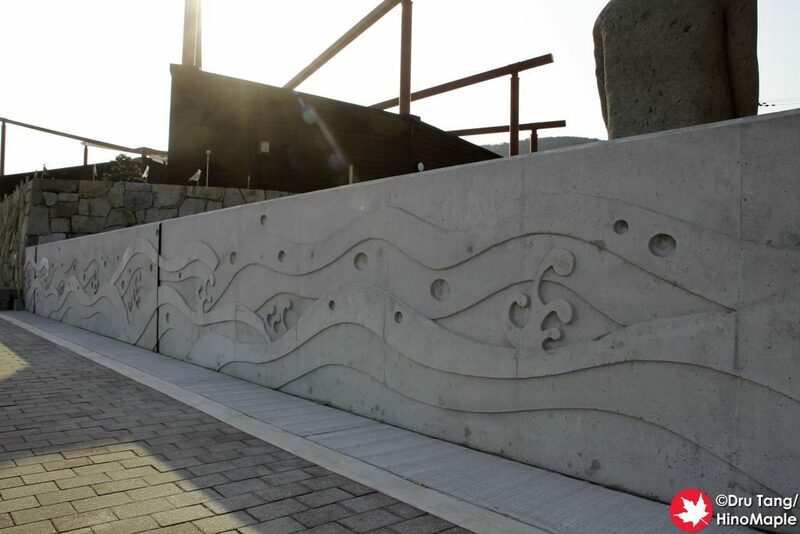 The wall itself is also moulded with a design that was originally “Parking Lot for Sea Gulls”. I don’t know why they were different artworks 3 years ago but I agree that combining them into a single piece is a lot better and makes more sense as they go hand in hand. Unfortunately I didn’t find “Parking Lot for Sea Gulls” to be that interesting compared to the sea gulls themselves. 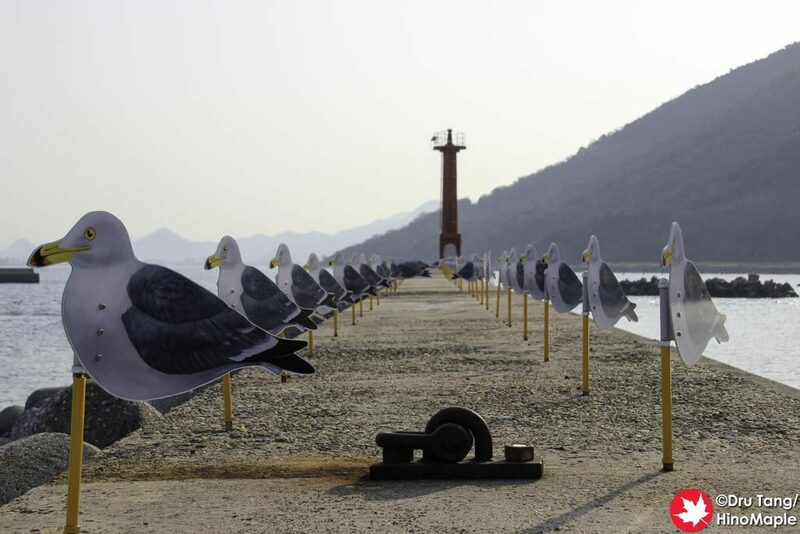 This entry was posted in Setouchi Triennale and tagged Megijima, Sea Gull, Sea Gulls Parking Lot, Setouchi, Setouchi Triennale, Takahito Kimura, Triennale by Dru. Bookmark the permalink. OK, from my understanding and memories, here is the deal with both artworks. 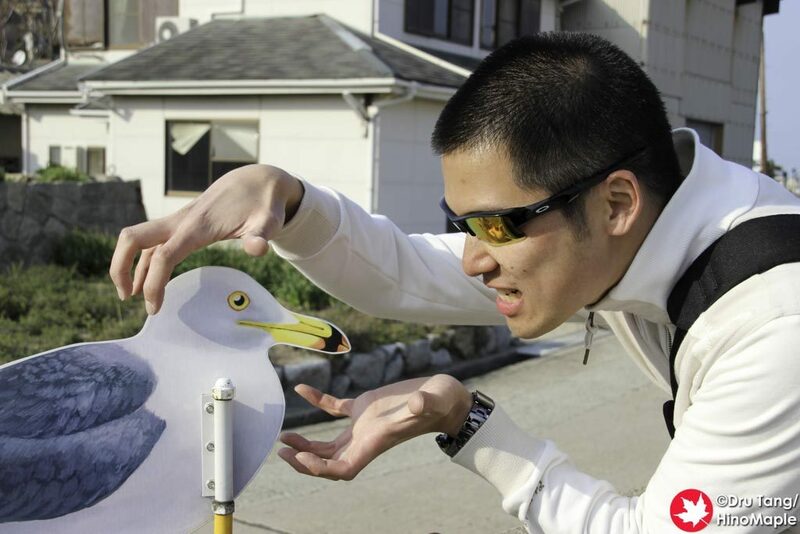 So in 2010, there’s one artwork, and it’s Seagull’s Parking Lot (the seagulls on the walls everywhere). Then a second artwork was added in 2013, or rather was supposed to be added. I’m not sure when the decorations on the wall date from, but the wall dates from 2012 and I assume the decorations too, as they’re a part of it and not added on it. The thing is that the artwork is unfinished. It was supposed to be finished during the 2013 Triennale with workshops and things that didn’t happen for a reason unknown to me. So, in 2016, we’re back to one artwork, the original one from 2010. Thanks for the info. That is one big mess. Guess it is “finished” in a sense. Then again, it could have been like the EAT&ART TARO one where it was an event classified as an artwork. I doubt it but who knows. I don’t know what happened, but the thing is that they publish everything around March, and then the information doesn’t really get changed, especially in English. Eat & Art Taro’s thing is not really an event, more a “short term exhibit”, but it’s very hard to classify as his art is basically food. Eat & Art Taro’s art is indeed quite hard to classify. I guess this year it was almost a week-long happening, but three years ago, his soups were indeed little works of art. Good luck with posting for every artwork. I mean it. That’s what I tried to do in 2013, and I still have some artworks from then on my to-do list (I guess I may still do the permanent ones, we’ll see). You will read about it later, someday when it is posted, but I felt the EAT&ART TARO was more about communication rather than the food. The food was interesting in and of itself but trying to order something using hand signals was fun. Oh by the way, Eat & Art Taro (why all capitals? You’re getting influence by Engrish typography?) is not the name of the event or the art, it’s the nickname of the artist. Regarding the all caps, it is mostly because that is how he does it. I couldn’t find his “real” or full name and his website and promotional materials always shows it in all caps, so I did the same. Kinda like how Ichiro is always written in latin letters and usually in caps. I see… I always find it weird (or annoying depending on my mood) how Japanese people don’t understand Latin script. I feel that they consider lower and upper case a bit like hiragana and katakana, and that they can use them how they feel is “cuter” or whatever. Actually, I think it’s part of our duty to teach them how to use the script properly. Sure the Japanese may always write ICHIRO, but they’re the ones who are wrong here. I don’t think we should follow their lead on this one, rather the opposite actually. Back to our artist, I don’t know his real name (saw it once, I forgot, it’s Taro Something), but “Eat & Art Taro” (or EAT & ART TARO if you really insist) is his artist name. I have no problems with it as long as it is a proper name. However you have to be consistent. I hate to see EAT&ART TARO and then EAT & ART TARO and then eat & art taro or even worse Eat & art Taro. Titles, signs, logos, etc don’t have to follow the usual typography rules. For example, the logo is SONY, but it’s not OK to write it as such in a sentence, it has to be Sony.. Yes, maybe my hiragana, katakana comparison doesn’t work. I’m just trying to figure out why Japanese people have such a hard time with this. So, I have a theory: they never even learned the basic typography rules of latin script, and as a consequence, they likened upper and lower case to what they know best, hiragana and katakana. But that’s just a guess from my part. However, this Fall semester, I taught a writing class for the first time, and I think the answer is simply that they have no clue what to do with two sets of letters. They know lower case is for “normal” writing, but a lot of them, really don’t know what to do with upper case. I see your point. I think I’ve been in Japan too long now. I’m just used to writing it as they write it, specifically to names. It is almost a design choice too. I find latin script to be easy and I wasn’t really taught the finer rules of using it, at least as far as I remember. Aside from sentence structure and proper names I wasn’t really taught too much more about things like the AP style and such. Either way, new languages are hard and I have no problems if they want to mangle the English language within Japan. As long as they realize things change once they are outside Japan.